Manitoba has some of the most beautiful weddings! Whether your wedding is being held in one of Winnipeg's finest ballrooms, in one of our historical buildings, at one of Manitoba's rustic wedding venues or simply in your backyard, we make it easy by enabling you to work with just one provider for all of your Audio, Lighting and Video. Crystal clear audio for everyone in the venue is what you can expect from Real Time. 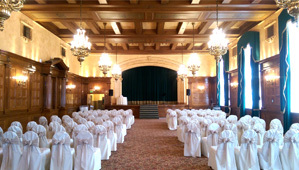 We have a variety of systems in various sizes perfect for any wedding reception, dance, ceremony or social in any venue! Decorations make a reception look right. Ambient lighting makes it feel right. Let us paint a scene with light using your colors at your wedding and create that perfect atmosphere. Our goal is for every guest from every seat to see the video content clearly! This includes the head table!! We make this happen by utilizing a wide variety of projection systems and TV screens. We often setup multiple screens in various locations of the venue. Whether you're having a slideshow loop all night, various videos played at specific times, whether you want a live camera feed on screen or all three, we have the video equipment and technicians to make it happen seamlessly. We are not a DJ service. We are the audio visual experts that care about the presentation of things. Let us provide you with a quote including everything you need for your wedding!